This post is a combination of two previous posts regarding a fake CNN report about Synagen IQ and an identically fake CNN report regarding Cogniq. Both of them are said to enhance brain function by amazing amounts, and both are simply lies. Update Sept. 4, 2015: A commenter has filed a complaint about this scam with the Federal Trade Commission. If you want to find out what the FTC is doing about it, you can talk to someone at the FTC at this number: 877-382-4357, and give them reference number of 65703157. Let us know what they say. So they are even inserting the ad in the middle of old news articles. For those who are interested, the point of my other post is to persuade African American voters that Hillary's current attempt to align herself with President Obama -- the reason she does so well with the African American vote, and the only reason she is even still in the race -- is just more cynical Clinton politicking. End of update; here's the other post, with this picture: http://pricefixer.blogspot.com/2016/04/hillary-clintons-calculated-courtship.html. 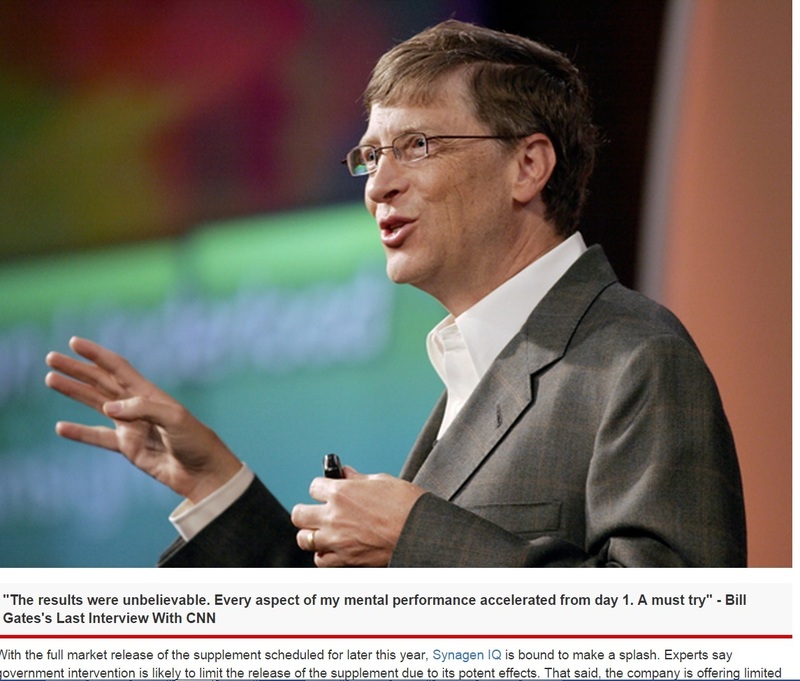 and found a CNN report that touted the amazing benefits -- as shown by a Harvard(!) study -- of a pill called "Synagen IQ", or a pill called "Cogniq," you've come to the right place. Both are clearly scams, because the reports use the same fake celebrity endorsements (Stephen Hawking, Anderson Cooper, Bill Gates, Ashton Kutcher, Denzel Washington, Tom Brady, and more), fake Harvard doctors, fake CNN doctors, and even the same pathetic typos in describing fake results of these fake and fraudulent pills. The Supplement they created is now THE [PF: really? this is reporting? ]best treatment available to improve memory, sharpen attention, increase focus and boost overall IQ. Ok, that was the fake report about Synagen IQ, including fake comments and all. A couple of days ago, I blogged about the fake "CNN Report" that has been appearing for Synagen IQ. Googling around a little bit, I found that an almost identical fake CNN report, including the same typos, has been circulating about Cogniq. I actually predicted this in my original post -- that the names mean almost nothing; the game here is to get people to buy the stuff before they can figure out that it's all a big scam. As long as they can stay one step ahead of bloggers like me (i.e. people who capture their fake reports and help expose the scam), they'll always be able to sell their snake oil under some other name. If you google "Synagen IQ scam CNN," you might get my initial blog post, but if you google "Cogniq scam CNN", you might not. In an interview with Anderson Cooper, Stephen Hawking said that his brain is sharer than ever, more clear and focused and he credits a large part to using Cogniq Hawking went on to add “The brain is like a muscle, you got to work it out and use supplements just like body builders use, but for your brain, and that’s exactly what I’ve been doing to enhance my mental capabilities”. Everyone that has taken this, from athletes like Tom Brady to musicians like kanye West have nothing but praise for the brain booster, which doubles IQ, skyrockets energy levels and connects areas of the brain not previously connected. 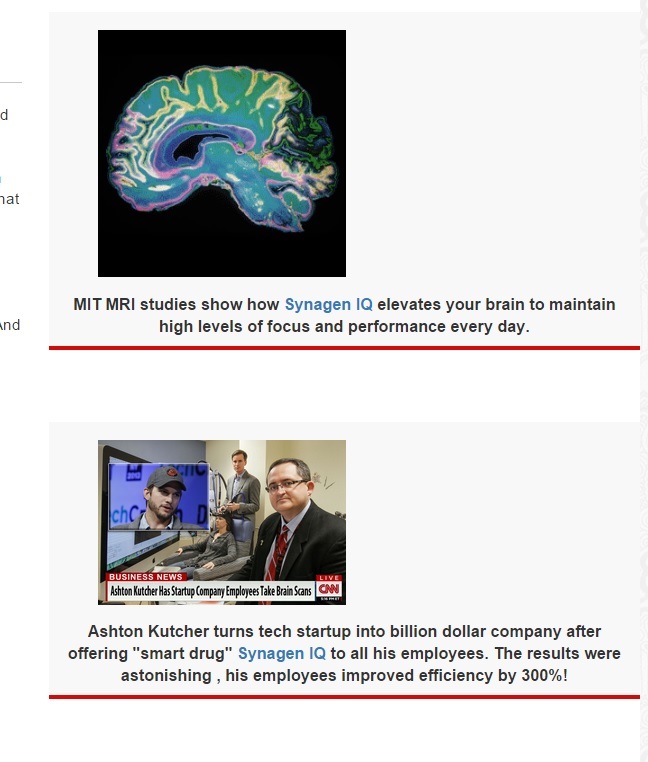 In other words, the fake CNN report for Cogniq is essentially identical to the fake CNN report for Synagen IQ. I sure hope that not too many people are sending money to these crooks. If anyone reading this is aware of any other such fake, disappearing CNN reports like these -- on any topic whatsoever -- please send a comment. This could be a whole new kind of fraud that could do a lot of harm to a lot of people. So those are my two posts. If these people can be identified, this alone should be enough to shut them down. Submit a complaint to the FTC! I truly believe this is a scam, and the writer of this blog is right, it is outrageous how you can publish a fake CNN news, etc...I saw this today on the Comcast page, not as an advertisement scam, so I shocked about the claim of this product properties and all these personalities, unbelievable, outrageous, I have no idea how is possible this!!! Steven Hawking will think the same thing I did when this popup was on my screen. "I would never say the brain is like a muscle. It's not at all like muscle. Who wrote this?" Thanks; it looks like they were just about everywhere today. I saw the Hawking picture on cnn, and if I refreshed the screen, it would go away (and be replaced by something that looked more like an ad), but if I refreshed it enough times, the Hawking picture came back. It's gotta be illegal; somebody just needs to file a complaint with the FTC to get them investigated and shut down. Thanks for reporting that Tamara. Sad that this scam seems to be spreading instead of being shut down by the FTC, or by CNN. Sept 1., 9:40 am... What boggles the mind is why would CNN let it stay up? My opinion of CNN just took a huge nosedive because it was using the CNN banner. My guess is that CNN has no idea. In this day and age, it's just computers talking to computers, and the computers have no way of realizing what's going on here. But by now CNN should certainly have heard that these "ads" are out there, and they should be at the forefront of those calling to shut these snake oil sellers down . . . . Saw this on Sept 1 at about 12:30p EST. I cannot believe that this type of advertising is actually possible to run on CNN and other popular sites. Disgusting crap. Yeah they are going wild today -- I personally saw it on both cnn and on cox.com today. I agree it must be illegal, but I have a feeling these crooks will be hard to track down, and they'll keep reappearing under different names, selling the same garbage. They have, I found webpages here in India selling it under the name Brain Plus IQ, with the same references and images of Stephen Hawking and Denzel Washingtion along with Anderson Cooper. I'm glad you found it too. I wonder how many sales they made today . . . .
9/1/15 2 pm Is on CNBC website, looks like a regular story until you open it and realize this has to be fake which brought me here. 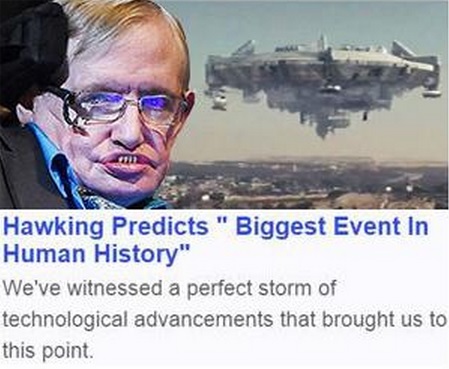 I saw Hawking and thought oh I wonder what he's talking about. Crazy! MSN, Comcast, CNBC, CNN, and Cox so far. I assume they are just buying advertising space on "news" type pages, and it looks enough like "news" that people click on it. And sadly, some people trust Anderson Cooper and CNN enough to think it might just work. Not a bad scam, but a scam all the same. I didn't buy any, but found this site and am as outraged as everybody else about this scam. Following your advice and link I submitted an anonymous complaint to the FTC. It only took a couple minutes and I got a receipt with a reference number of 65703157. The receipt said I could call 877-382-4357 to speak with a counselor. If others are too lazy to file a complaint they can just call that number! Finally someone takes my advice!! Let us know what happens when you call them! I'll update the main post with those numbers. I'll be calling too and use the reference number and come back let you know what they tell me too. That looks like the same link I saw. And sure enough, if you use it now, it redirects to http://www.lulus.com/whats-new/page1-60.html. I wonder how they do that? I wonder if lulus knows . . . . I just saw the ad on CNN too. I didn't believe that they were allowed to run such a scam, so I googled it and found this page. Call me cynical, but I have a feeling CNN has already consulted its lawyers, and they have said it's just not worth going after these people. But feel free to try to get CNN's attention on this; it really is pretty crazy that people are able to sell products by fraudulently using the names, images, trademarks, etc of a respectable news organization. Just saw it. Thought something was wrong. Here's something new to try. If you click the Synagen link it goes to Synagen's home page. However, there is an AFFILIATE ID embedded in the link. If you copy that link and send it to Synagen, they may close them down knowing they would get in a lot of trouble if they didn't. Alternatively you can send them a link to this page. My question is how does the ad get onto CNN in the first place in that spot? CNN needs to put a stop to this. Either that or the FTC complaint should get them in trouble, but they'll probably just change their names and show up somewhere else. I agree about CNN -- as I just said, I think they probably already know about this and don't care, but maybe I'm wrong. You'd think they'd be able to put a stop to it -- the sellers of Synagen aren't too hard to find, since they are collecting people's money. I just saw it on NBC News page, 9/4/15. NBC news -- that's a new one as far as I've heard. It seems clear that they are placing these fake reports in places where people normally expect to see news . . . . Saw this on cnn today just moments ago. Surprised CNN let's that get through, as they make it appear as a real CNN article. Only after I went back did I notice "Advertisement" at the bottom of the banner. yeah, I've seen it with "advertisement" and without, but even when it says "advertisement," it's easy to convince yourself that it's talking about what appears below it (which in my experience has always been an ad). Bottom line is they are certainly doing this by paying for advertising, so sometimes the host site will be smart enough to label it as such. But apparently not always. weather channel -- another new one. They are targeting people who like to be informed. that's good to know -- is there something we can do to shut THEM down? 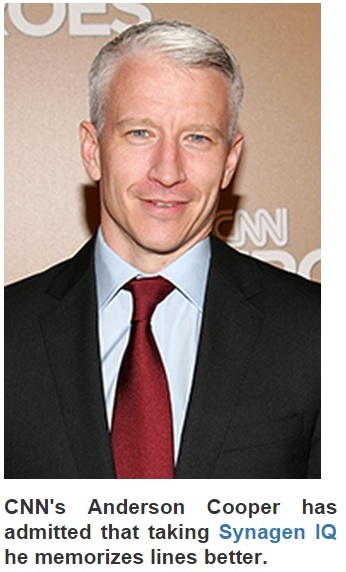 Saw this on CNN today 09/04/15 as an AD on their home page. Based on this and another comment, maybe CNN's software is getting better at labeling this is an ad. That might not be completely in CNN's financial interest -- the reason they call other paid ads "promoted stories" is so that people aren't discouraged from clicking on them, which presumably gives revenue to CNN. If you google 'synergen iq reviews' you get a number of articles headlined 'Scam exposed.' However, most won't open, and the ones that do are further advertisements, with the only 'downsides' listed being that there is no list of ingredients and that the pills are only available on line. Clearly more material attached to the scam. I guess that if you're selling a scam product, you try to fill up the internet with "scam" hits for your product, so that sites like this don't show up on the first page of search hits. It's not working for this particular scam. I'll be calling the 800 number to complain and let you know what they say. For some reason this bothers me so much because I've been duped twice into clicking on this ad and I'm not the type to click on ads like that. I imagine it's the outright lie and the wording that makes me think it's not an ad and something scientific I'll be reading. Jeez!!! Thanks for writing this piece and for all the great info on this scam. Thanks for your response and for taking the initiative with calling -- let's hope others do as well. If enough people call, the FTC will do something, I hope! Looking forward to hearing back from you. Saw the add just as you described and suspected it was a scam so did a google search and found this blog. I can't believe with the resources CNN has (investigative reporting), that this is still out there. Saw it today 9-5-15. That's what I was thinking. This would be the perfect thing for Anderson Cooper to do an investigation on. Seriously, if there are any investigative journalists out there, they could do some good work exposing this kind of scam and working to make sure it doesn't happen again. The CSS isn't optimized in certain browsers. That clued me in that this was a malicious redirect. Most of us saw something starting with http://www.cnn.com-news.report . . . ., and that's what put us off our guard, until the article itself became increasingly unbelievable. It's sad that there are skilled programmers who are willing to get paid to do stuff like this (of course, given the amount of viruses and malware infesting the internet, we all know that there are a lot of very anti-social programmers out there). I hope that the programmers get tracked down as well -- they are the ones that make this scam possible. And if they are willing to do this sort of thing for SynagenIQ, they will doubtless be using their talents to fleece members of the public in other ways as well. Xfinity definitely fits the "gateway site" pattern. There are a lot of people who mainly use their internet access to access their email through their cable company, and they are the easiest marks for this kind of scam. The Christian Cross is an interesting angle. The picture in the main post has an alien spacecraft behind Stephen Hawking, and I've also see one with a nuclear explosion behind him, but I haven't seen the Christian Cross yet. Something to look for. This article appeared in the list of legitimate stories on CNN site, I stupidly decided what the heck blow $49 and try it. Site did not provide page showing order, charged me $189 instead of $49, called cust support immediately and cancelled, did get confirmation of cancelled order, will double check again. I am extremely stringent about not clicking anything suspicious, and it ps's me off that CNN would allow a realistic looking story in the main story column, no excuse! Wow. You ventured farther than most of the other commenters here; I hope you get your money back. No matter what, please call the FTC at 877-382-4357, give them reference number 65703157, and tell them about your experience. You'd be doing hundreds or thousands of potential victims a service! Thanks -- I don't think anyone had reported AOL yet. They really seem to be covering all of the main access points for the Internet. I'm just surprised that this seems to be the only site trying to do something about it. Millions of people must have seen the link by now, and it wouldn't surprise me to learn that millions have clicked on it, just to see what Stephen Hawking has to say. And even if only a small percentage of people fall for the scam and place an order, the company is making money hand over fist with these "ads." Pretty creepy. But it must work a certain percentage of the time, or they wouldn't do it! Interesting. I went to laptopmag.com and saw it there, but laptopmag.com seems like a fake site to me. I cut and pasted some of their content, googled it, and found that it had appeared elsewhere as well (try it with "BERLIN - The flagging tablet market is in desperate need of some innovation. Some companies are opting for odd add-ins such as projectors."). I really have no idea how the Internet works, but I'm becoming increasingly convinced that things are just not as they appear, much of the time. scam, and copycat content sites like laptopmag are simply used to help sell pills. 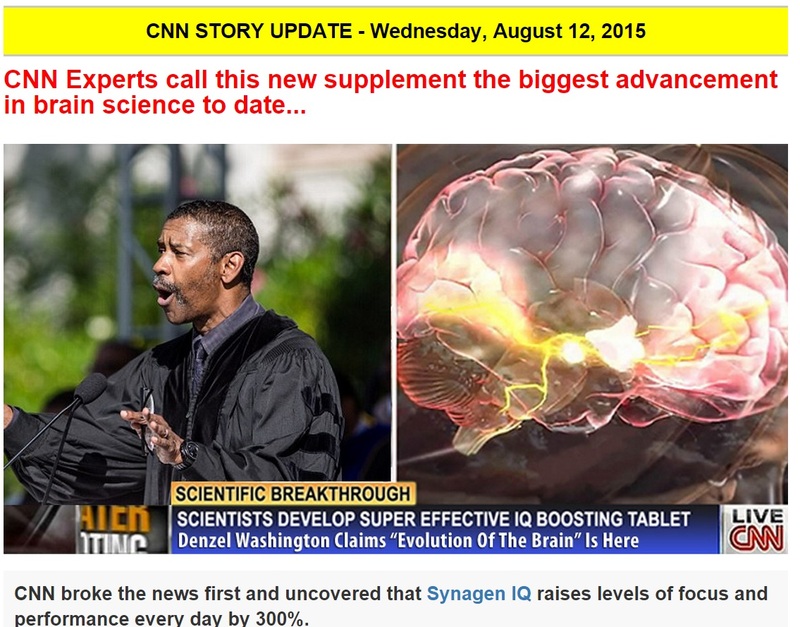 Found the ad on CNN 9/8/15, but they were promoting it under the name "Neurocell". Then I found the exact same ads using the name Synagen IQ, instead of Neurocell, when I did some research. Their fake ad looked very convincing, especially when it was on CNN.com, but it just seemed too good to be true (especially the outrageous claims at the bottom from supposed reviewers), so I had to search around and check it out. Glad I did! Thanks for having this posted. I'm sure it's saving people a lot of aggravation and headaches! I checked this out too. I can't find any reference to "neurocell" as a nutritional supplement on the internet. But the provided link does in fact have the same fake CNN story, but starring "Neurocell" and not "SynagenIQ" or "Cogniq." I went ahead and copied that ad into another blog post (should be above somewhere) -- if anyone else sees Stephen Hawking hawking Neurocell, let me know. As mentioned in that post, I'm now wondering if perhaps the scam starts with whoever wrote the report. Maybe the fake report is available for sale for any IQ-enhancing pill-peddler who wants a quick bump in sales. If I had to guess, I'd bet the sellers of the report are able to point to some very impressive sales figures that result from using this ad. It sure would be nice if some investigative journalist would pick up this story, unravel, and tell us all what's going on. And make it stop. it's absolutly a scam and anyone that can't see that is ridiculously blind. com-news.report could be used for ANY WEBSITE ea, you register a domain com-news.report (.report is a new TLD became available a while back, and thi is a scam that's been going on for a while. I'm actually surprised there isn't some ethical hackers out there taking action as no one else will be able to. it makes me wonder if you're not part of it. I copied it so anyone doing an investigation will be able to look at a reasonable facsimile of their ad. I'm never able to find it on the internet, so I think I'm doing a service by copying it here. Like I said in my other reply, if anyone who gets to this blog is dumb enough to buy these pills, I don't think there's much hope for them in the first place. But maybe I don't understand how I'm "promoting their keyword" and how that's a problem. If I search for the names, I find mostly their ads (or more of their scam fake reviews etc); they already have that keyword covered. And I think it's a good thing that this blog is an easy search hit, because as far as I can tell, this is one of only a very few sites on the internet that have noticed this scam. in fact, i'm actually almost 100% sure, this price fixer blog spot is part of the scam. Theres a whole f---ing network of scam sites associated with this, and I can prove the entire thing. What's wrong with you f---ing people, if you're so smart as to do this, then use your talents for something worth while, you can make so much more legatimately, too bad you won't ever figure that out. Get some f---ing ethics. Anyone who is a smart internet marketer would be able to figure out the keyword associations, and the content network that is infecting everything with this. Ya, it's a smart SEO method, and gives me some really grand ideas, however, you really should not f--- people over, it comes back to bite in the end. believe me. I understand where this person is coming from -- on the Internet, nothing is what it seems, and everything could be a scam. But this blog is NOT part of the scam. If anyone is dumb enough to buy any of those brain pills after reading what I've said about them, I suppose they get what they deserve. And again, if you want to stop this, just call the FTC (877-382-4357), and give them reference number (65703157) and ask them what they're doing about it. And feel free to tell them you think the Pricefixer blog might be part of the scam. Whatever works for you; just call them. It sounds more likely to me like the profanity guy is part of scam network because he seems to be really irritated that people are verifying the scam through this site! What a numb nut. Yeah, that seemed possible to me, but I like to give my commenters the benefit of the doubt! 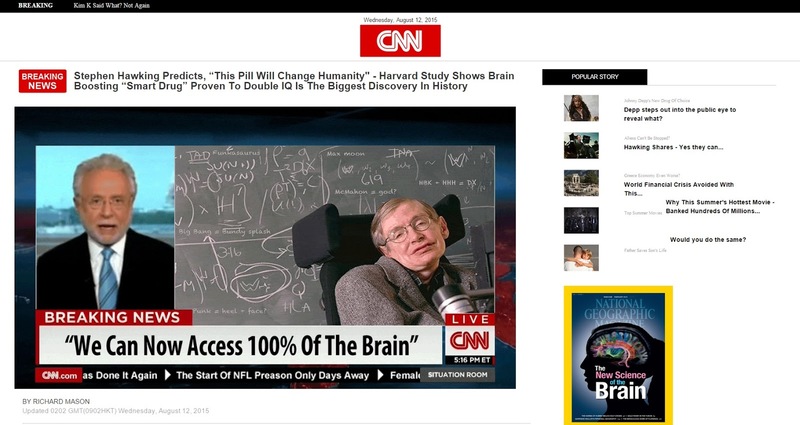 I saw the ad but the link didn't take me to CNN.Com, it took me to http://www.cnn.com-news.report/us/brain01/cnn/hawking-2015.php?sid=stitch01&q=1avbe9i whixh is NOT CNN. Other than that, everything is the same as in this article. If this product actually worked it would be world news by now, no a sidebar scam. Just to make sure folks understand this; CNN is CNN.Com, NOT www.cnn.com-news.report. This is a FAKE website setup just for this scam. I mean come on folks, if all of a sudden Google.com became Google.com-YouAreIncrediblyStupid.kissmybutt would you still think it was Goggle? Thanks for clarifying. Of course, I don't think anybody necessarily thinks that the URL is CNN. The problem is if you're on CNN and you click on what looks like a link to another CNN story, and then you see Wolf Blitzer and Anderson Cooper, and CNN logos all over the place, you don't always double check the URL. At least you don't until you realize how far-fetched the story is. The problem is that people's guards are down when they think they are watching/reading honest news reporting -- that's why so many ads are fake news reports and news stories. Hmmm. This thing has been going on for nearly a month now (probably longer; it's just that I only noticed it a month ago). aol, msn, comcast, and cox, not to mention cnn, have all been happily accepting payment from the scumbags who are using the fake story to sell their fake brain pills. By now, I'm sure someone has alerted the ISPs to the scam. And yet apparently, they are still allowing the link on their sites, and probably getting paid for it. I wonder how that works exactly? At some point, you would think the people who permit the ads to be placed become at least partially responsible for the damage that they cause. Maybe that's the next step. If you thought this was a scam on CNN, then did you contact CNN to let them know about it? No, I don't know how I would do that anonymously, so I'm relying on the people reading this to do that. Anyone reading this, you'd do the world a favor by contacting CNN and letting them know about this scam. They must be getting ad revenue from somewhere, and they should be able to trace it. Very interesting. The link to their page appeared as a Facebook post on my iphone Wunderground ap. I was curious about it because rather than the ship from the "District 9" movie to the right of Mr Hawking's picture, there was a cross with light rays beaming past it. Knowing that Mr Hawking is an atheist, I curiously followed the link. After doing a little Googling, I found your article. How is the world are these people skirting around FCC regs without being sued by CNN, Facebook, Mr Hawking, or all of the other celebrities for their fabricated endorsements?! Another really important question: Who is this person that know's who Stephen Hawking is and would actually fall for and purchase this snake oil BS? I'm astonished as well, but I've been told that it's just not worth celebrities' while to go after this kind of thing. Lawyers, you know. But it's clearly illegal. The scam was reported to the FTC over a month ago, but it seems clear that the FTC hasn't done anything about it. Let's all call them and ask them what they're doing about it. FTC: 877-382-4357; Ref. No. 65703157. And in answer to your second question, maybe the people who end up buying are the ones who click because they recognize District 9! There's clearly a percentage of people out there who see the ad and then buy the product. It may be a small percentage, but if one percent of a million people buy the product, they've sold ten thousand bottles. Good morning! It is now known as "Nuerocell." Same exact line of bull...."I took this pill and became CEO in six weeks!" I saw that line and laughed out loud. Thanks for writing; judging by yesterday's and today's hits, they've had a lot of ads up lately. I have a feeling the scam is quite successful, or they wouldn't still be doing it, with little change. I guess people tend to overlook the clues (especially while reading their cell phones), and tend to assume that it can't be fake, because that would be totally illegal. I wonder when the FTC is going to actually start making a move on this. They are now using Trump and the BBC. I'm going to assume this is a joke, since even the most gullible among us are not likely to think that Trump's IQ has doubled any time recently. But if it's true, send me a link or some real proof and I'll post it. That goes for anyone else who sees some variant of this scam that I haven't posted about yet -- this is NOT a full time job for me; I just post what I happen to see. I have a feeling there is a lot more to this scam than is reported here). December 17, 2015 at 11:20 a.m., a fake CNN breaking news popped up on my wife's phone. It linked Stephen Hawking to the pill, in which Hawking praised the pills effectiveness. The breaking news was entirely credible until she realized that CNN would never sponsor a specific brand. They might discuss a new medical break-through but they get paid for ads. Thanks for reporting that John -- that could explain why I've been getting so many hits without comments lately; people are seeing the ads on their phones. Your comment prompted me to check page views by browser. It turns out 50% of my page-views for these Synagen/Neurocell posts are coming from Safari, compared to 20% from Chrome and only 2% (!) from Internet Explorer. That seems like a very strange distribution; I wonder what it means. Maybe they are mainly targeting apple users for some reason . . . . Brain Scientists Invent World's First IQ Boosting Supplement. Thanks for this comment -- I googled it and found the byline -- with today's date -- and it's another of the same ads, this time for Synapsil, although they accidentally call it Addium at one point. I created another post with a copy of that ad. Without readers like you, I wouldn't be able to keep up with all the name changes! The page is almost word for word what you posted with a few changes. "Kanye West" is now capitalized. Stephen Hawking however, is still quoted with atrocious grammar. Be warned, they are still out there. Thanks for spotting this and sharing it. I took a look and I see that Bear Grylls, like Anderson Cooper, also did a 14-day trial, and had exactly the same experience. And I mean EXACTLY the same, down to the punctuation. I've reproduced them side by side in a new post; maybe Bear Grylls will step up to the plate and help put a stop to this scam, which is victimizing elderly people. When you order this product it must be returned within a short period of time or you will be a member and get this stuff shipped forever and billed - but huge. Then to really help the scam industry you will be enrolled in a weight loss product with no cancellation features, and billed on the basis that you accepted the first shipment. But the science editor of NBC News supposedly tried these pills...IS THAT A FAKE TOO? Yes, absolutely fake. If you provide a link, I'll check it out. seems the whole internet become a scam business from stockmarket to supplement and vitamines how can an average person protect himself ? I only collect the scams I see personally, and that aren't completely obvious. I'm sure there are many many more our there. The sad thing is that there is only a very fine line between the downright lies told by false advertisers like whoever is pushing these supplements, and the pseudotruths told by corporations like CVS that will sell you generic medicine at brand prices if you don't know the magic words, or have the sense to go to Wal-Mart or Target. Or the drug companies themselves, which will push their patented drugs over equally effective generic substitutes. It's not just the internet -- it is just that everyone out there is trying to make a few extra bucks off of the trusting and inattentive masses. In fact, the internet should be a tool that consumers can use to fight back against information inequality, and expose scams, frauds, and dirty tactics wherever possible. July 24, 2016. A friend just sent me the exact same "news story" on "Geniux". Same claims, same phony scientists, the whole phony thing. Someone else noted something on the blackboard which SEEMS to be behind Hawkins, and if you look carefully, nothing written there makes any sense. "funkasauras"? McMahon = god? Some scammers idea of being cleaver, I'd guess. Good work on fighting these crooks. Too bad government agencies who are supposed to protect gullible people like my friend don't seem to be doing their job. PS: I'd sign my name (Harvey), but I'm not linked to anything listed. Thanks Harvey. That's hilarious about the blackboard; I didn't notice that before but I just scrolled up and you're right -- I can definitely make out "funkasaurus" and also "McMahon (or Malcolm? )= god?" And yeah, Geniux seems to be doing pretty well with the gullible -- I'm getting a lot of hits on that post! Today I read a story about the FBI director whining again because they can't get into our smart phones, instead of doing the job they should, like protecting people from this kind of fraudulent scam. Just saw it on a website masquerading as a Forbes article. Exactly -- if the government is so concerned with protecting us from all of these perceived threats that they need to hack into our i-phones, why aren't they protecting us from REAL threats that do harm to vulnerable and elderly citizens every day? Sadly, this scam is just the tip of the iceberg on what the government could be doing but isn't to protect us from rapacious and unethical practitioners of "free enterprise." To me it was immediately obvious that this was a complete and total scam but I am naturally skeptical when wild claims, as these types of products make, are tossed about. I stopped at the usage of "got" in Hawking's endorsement. Hilarious. I did a search at the Harvard Web site and the name Rosenhouse was not found. The search included both students and faculty. Just found you w/google search after encountering fake CNN site today, 11/12/2016.. It's still out there. Found it today with Trump endorsing - - Hope Trump goes after them. Still up running strong. Why can't someone shut these assholes down? Coming up on two years and going strong. someone's getting rich. Thanks for posting. Today this article popped up for me in a popup window. I found this post as I was trying to find out more information on the supplement. I saw the story this evening on the Yahoo news page. It sure looked like a CNN story! Until I got to the link & info to purchase it at the end. My parents are in their mid 70s & I was interested in the article because of them. Can you imagine how many elderly people are falling for this, not knowing how to tell that it's fake? It makes me sad! Thanks for posting this & confirming my thoughts. Look; if CNN doesn't hire people (sleuths and lawyers) to go after these typical capitalist predators .....they must be on board with it. Free advertising. Filed a complaint with the BBB I am a senior citizen and thought this was ok with Anderson Cooper approving it. Here is my complaint to the BBB. 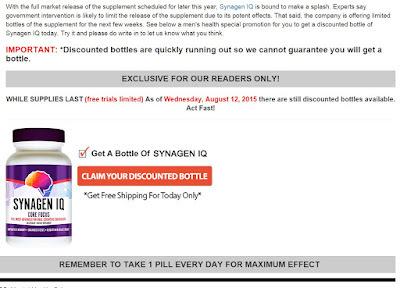 The Website just popped up It offered trial of Synagen IQ for only shipping of $4.95. It said it be delivered march 20th 2017 the order was placed march 18th. 2017. Of course it did not come in 2 days. NOWHERE did it say I was subscribing to a repeat service. I found this out only after I placed the order in Very small print very light text at the very bottom of the page. 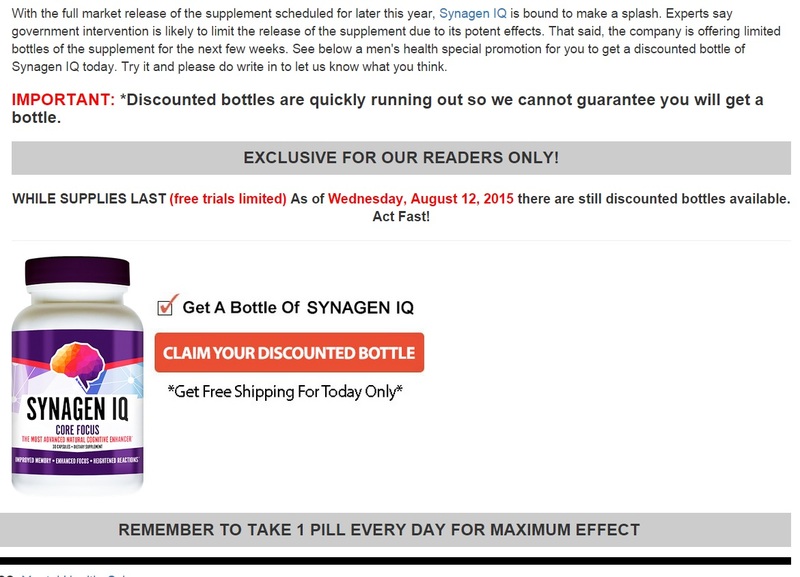 It said By placing an order you will pay $4.95 for shipping and will be shipped a 30 day supply of Synagen IQ. You will have 13 days to try the product (plus 2 days for shipping thus giving you 15 days from today until you are billed). 15 days from the date of purchase, you will be charged $84.71. If I had not seen that they would have charged $84.71 on my CC every month. I called and canceled it 5 minutes later. I contacted my CC right away and disputed the $4.95 I want the $7.50 cost I had to pay to ship this back to them. This Co. is a HUGE SCAM not only for this product but for many others. THEY SHOULD BE SHUT DOWN!! How many unsuspecting people have to be scammed while they continue to STEAL MILLIONS!! I plan on reporting this Co. to my local congressman so they can start an investigation into this SCAM Co. and I suggest others do the same!! I'M MAD As HELL AND I'M NOT GOING TO TAKE IT ANYMORE!!!! I want the $7.50 cost I had to pay to ship this back to them. And I also want any $84.71 charges refunded that ever show up on my CC from this so called Co. This Co. is a HUGE SCAM! Hi Hank -- I'm glad you took action, and I hope you get some results. I hope when you talk to the Better Business Bureau you also specifically tell them about the false advertising and fake endorsements that caused you to order the product in the first place. Feel free to send them to this site -- it shows that the scam has been going on for a long time, and they might find other useful evidence here. Please report back to us what happens with your complaint! Oh Goodness, happened to me the same. They have a service contact center but they never answer the line. I have been charged with 11.00 and never received the pills. OK... You guys get that this is NOT a CNN website, right? http://www.cnn.com-news.report is a page on a server (www.cnn) in the "com-news.report" domain. The "report" TLD is a fringe TLD with domain names sold by GoDaddy and Dynadot. The ownership of "com-news.report" itself is hidden behind Dynadot's privacy protection. So there's no hacking of CNN's site or bazaar virus involved here. The URL is clearly designed to dupe unwary visitors into believing they're looking at CNN's site. This is the same kind of scam used for fishing attacks on bank account holders. Would you type your Bank of America account password into a "bofa.com-account.info" web page? If so, you will have given the fraudsters the keys to your bank accounts at "bofa.com". If you're going to play on the world wide interwebs, it's time you learned how to read a URL. I believe this supplement was originally sold to a man named Jack S. as bean seeds. When he planted them a giant beanstalk grew in his yard. Has anyone tried planting them instead of swallowing them?